Gifts come in an endless variety of sizes and shapes and purposes, and to most adults seeking happiness down through the ages, they often come in the form of answered prayers. For a farmer, a welcome downpour after a month of drought; for a young swain ablaze with passion, the hand of his beloved in marriage; for a haggard, weary mother, a break in an ailing child’s fever. Down through Scottish history, time and time again, that desperately desired gift has been a turn of good fortune in battle, that sudden, sought-for piece of luck that can turn the tide of warfare just enough to show a commander, or a captain, or a warlord an attainable strategy that might lead to victory. So it must have been for Kenneth MacAlpin, the First True King of the Scots, as he continued to battle Viking invaders along the Firth of Fife, in 840 AD. Weeks of pursuits and clashes had led to the warrior king’s encampment being savagely attacked in the first grey light of dawn, one sere and chill September morning, and thus he finds himself and his troops fighting a grim retreat down a long sloping brae, with the just-rising rays of the sun full in their eyes, and the buffering line of the MacAlpin cavalry beginning to shred apart. If only, he must have thought, if only we had some way to slow them down, interrupt this great push, divide their attention . . .
And then it happened - exactly what he had so needed, as the opposing line faltered, halting intermittently, the attention of the deeper Viking ranks changing and turning. New troops, entirely unexpected, had arrived from the east, axes and maces gleaming, having waited to scream their ancient battle-cries until the last moment of ambush, as they rushed upon the surging rear ranks of the Norse invaders. Falling like brittle wheat beneath the cyclone of the brutal attack, Pictish war ponies colliding like sudden thunder against the invaders’ rear lines, it was now the Viking forces who had to squint into the rising sun as they turned to face the fury of these interlopers. Caught as they were in this new and lethal maelstrom, pincered between the jaws of a beast bigger than they had foreseen, the Viking lines broke, and soon were being shattered, the remnants fleeing back to their longboats along the shores of the firth. By noon, the Celtic forces withdrew from their harrowing pursuit of the Northmen, knowing that such battles would yet continue, and the next great one would likely be leagues from this place. So thus might it be that the clan who became known in time, as the Grants began their bloodline, and ever after claimed the distinction of belonging to the Siol Alpin, or the Seeds of the Line of MacAlpin, as do the MacGregors, and the Stewarts of Appin, and the modern MacAlpines themselves. Now, can we suppose that all Grant historians and archivists might accept such an origin for their proud clan? Alas, we cannot, for as we strive to chart those rivers of our genesis, we always try to straighten out their course and flow, while endeavoring at the same time to irrigate all the crops that have sprung therefrom. According to one long-standing tradition, the founder of the Grants was none other than Gregor, second son of Malcolm, an early chief of the MacGregors, who lived in the mid-12th century. Purportedly he coined the surname for his descendants from the Medieval Gaelic word grannda, meaning “ugly.” in deference to his own appearance. Others however refute that peculiar touchstone in favor of the more geographic explanation of the old tribe’s first territory, that being the part of the Strathspey district known as the Plain of the Sun, or griantach, in the local dialect of the Iron Age Celtic speech. Indeed, that version might well support the Clan’s eventual choice for their own heraldic crest, that of a hill in flames, a reference to the old pagan practice of honoring the sun each year with balefires at the beginning of May. Still others entirely reject a native origin for the Grants, insisting rather that their ancestors were Norman, and entered the British Isles in the retinue of William the Conqueror in 1066. In this case, the surname would be from an evolution of a Medieval French adjective indicating great size, or great importance, such as Grande, le Grande, or de Grande. As popular as this historical prelude has become, though, it still does nothing to explain why this clan so zealously guards their inclusion within the ancient roll of the Siol Alpin. But whatever the family’s starting point, the first individual from their line whose name is known was Gregor, the Sheriff of Inverness during the reign of Alexander II. He was likely also the same man, recorded later as Gregor de Grant, who wed Mary, heiress of John Bisset, Master of Lovat and Aboyne. Their son, Laurence le Grand, succeeded his father as a later Sheriff of Inverness, and appears as having witnessed a deed recorded by the Bishop of Moray in 1258. Laurence went on to marry the heiress of Gilbert Comyn of Glencharny, creating the first connection to that family, which would serve them in ways both good and ill in times to come. A further product of the union of Laurence and Mary were two sons. The elder, named Ian, was well remembered by his peers as having been a strong and outspoken supporter of the patriot, William Wallace, who in turn valued Ian’s friendship enough to have knighted him during his tenure as Lord Protector of Scotland. 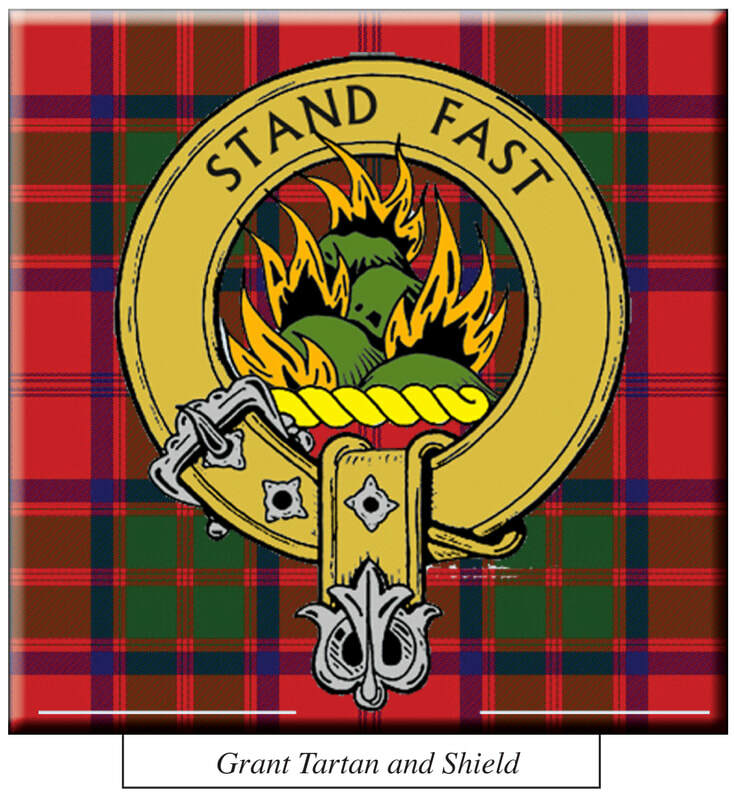 Ian’s cousins, John and Randolphe de Grant, were captured in 1296 at the Battle of Dunbar, but, as the Clan had by this time acquired the lands and holdings of Glenmoriston and Glen Urquhart (which they still possess, even now) they were ransomed without great duress. Undeniably, such resources at hand to protect one’s family is certainly quite worthy, as gifts go! As they had for the liberator Wallace, the Grants stood, and spoke and rode, for the Bruce, as a Champion of their homeland (despite their interrelations with the Comyns), and the unfolding epic of his victories helped to confirm and establish the Grants’ many, burgeoning lands and possessions across Strathspey. This was further strengthened when Sir John Grant, another Sheriff of Inverness during the 1430s, married Maud, an heiress of Glencairnie, itself part of the old Pictish principality of Strathearn; from that single union of John and Maud, sprang the Grant family branches of Ballindaloch, Freuchie, Tullochgorm, Seafield, Corriemony, and Glenmoriston! Surely, in all those happy decades, the ancient pagan sun god, old Beli Mawr, shone down in all his beneficence on that immense, sprawling wealth of grain and gold, and cattle and dowries, which seemed to be making magnates of every single Grant who could stand upright and shade his eyes at noon. Indeed, in the year of 1493, those lands were erected into the free barony of Freuchie, of which Sir Duncan Grant is styled the 1st Laird. A generation later, in 1536, a castle was built thereon by Sir James Grant, initially known as Castle Freuchie, which was officially rechristened Castle Grant in the 1690s. And what better gift to leave the future generations of a clan, than a nice, big, stone-solid keep? But let us dance merrily back from hanging all this happy holly for just a wee bit, just long enough to consider a story of Grant family drama that’s a bit more shadowed than their more usual sunlit times. In the years when that mighty Castle was still young upon the land, a young scion of the Grants of Stratherick eloped with the daughter of his host, the MacGregor chief; supported by over two dozen followers, the newlyweds fled to Strathspey, taking refuge in a cavern known as Huntly’s Cave, which was located on land occupied (at that time) by an elder chieftain of Clan Comyn, who was widely known as Comyn of Freuchie. Upon discovering the young couple and their retinue so encamped, the Comyn demanded with great urgency that they depart, but achieved no good result. No sooner had Comyn retreated however, then the MacGregor chief arrived, and though in high dudgeon, was warmly received by his new son-in-law, who insisted on ignoring the elder’s wrath, and feasting his arrival instead. During this hospitality, the young Grant managed to coordinate the passage of his followers, in and out of the firelight, to suggest a far greater number of men at his command than there actually was. This ruse worked so well, that the MacGregor chief became convinced that his son-in-law controlled at least three times as many as was really in his entourage, and this served to impress the chief into accepting his daughter’s new husband as a worthy asset. But such a lucky turn was not quite enough of a gift for young Grant on his honeymoon, and he pressed the new rapport with his bride’s father by persuading the chief to believe that the Comyn’s earlier visit had been instead an attempt at an attack, and that vengeance must be meted out. Before dawn broke, a combined force of Grant and MacGregor attacked the household of the Comyn, slaying the chieftain, scattering his men at arms, and seizing his land and holdings. Now there was a wedding gift for the bride and groom! But just to top off the nuptials, the MacGregor chief had the Comyn chieftain’s skull carefully preserved as a memento, which is purportedly displayed, even now, at Castle Grant. In 1488, a later Sir Duncan Grant’s son, Sir Ian Grant, joined the Gordon Earls of Huntly, and the Earls of Mar, in support of James III against the uprising of the Rebel Noblemen, and was rewarded with considerable royal favor. The heady ascension of Clan Grant underwent considerable turmoil and unrest, however, beginning in the mid 1620s, when an internal feud erupted between the Grants of Ballindaloch and the Grants of Carron. It involved a long and often dizzying chain of murder, and reprisal, escape, and outlawry, accusation, and exile, manhunting, and revenge, and spanned no less than a dozen years. The final arrests led to executions that took place in Edinburgh in 1636; although there was frequent involvement by men from the clans of MacPherson, and Gordon, and Crichton, no prolonged enmities, thankfully, bloomed outside the Houses of the Grants. Oftimes, the gift one least expects, is simply the vision of further trouble passing one’s door. When the Reformation arrived to shake the religious roots of the entirety of Scotland, the Grants swiftly converted to the impassioned new faith of the Kirk, and unequivocally declared for the National Covenant in 1638. After the Battle of Inverlochy, however, they hastened to join the Marquess of Montrose, and thereafter remained staunchly faithful to the Church of Scotland and the royalist cause. Sometimes, forgiveness can be a gift as well, especially from on high. During the first Jacobite rebellion, in 1689, Ludovic Grant, the Clan’s 17th chief, sided with England’s King William and his House of Orange; following their victory over the Bonnie Dundee’s forces at Killiecrankie, Generals Buchan and Cannon descended on the last of the Jacobite rebels at the Haughs of Cromdale, finding themselves amply reinforced with Ludovic and 600 of his loyal clansmen. This massive display of fealty garnered for the Chief not only royal appointments as a colonel in His Majesty’s army, and as the Sheriff of Inverness (a gift of commemoration to his forebears, no doubt), but the rare status of “regality” for his home barony of Freuchie, allowing him very nearly royal status within his own lands. Unfortunately this celestial enrichment was forfeit when the final Jacobite rebellion was put to rest, in 1746, for although the high majority of Clan Grant reliably took to their saddles for the House of Hanover, the Grants of Glenmoriston shocked one and all by following the Bonnie Prince. The hands that giveth, it would seem, may also taketh away! The surviving branches of the Grants in modern Scotland still hold much of their ancestral lands, and still wear that crest, upon their badges, of the Great, Burning Hill, with which they warm their many memories of sunlit greatness. ​A Gift, you might say, from the Ancestors, to all their beloved descendants!